Find the hidden insights in your data, so your team can make brilliant decisions. AI that delivers a stream of actionable insights to your team. We’ve invented a new form of AI that is able to automatically analyze your data and surface promising insights to your team. Unsupervised alerts you to the most important patterns and changes in your business — so you can immediately understand what’s actually happening in your business, and use that information to make better data-driven decisions. Unsupervised already helps some of the world’s biggest companies optimize their key business metrics. We help companies like yours get real business value from AI, faster than you ever dreamed possible. Unsupervised helps you understand what matters in your increasingly complex data, so you can quickly move to action. The complexity of your data has exploded over the past few years. You're dealing with more data than ever before, but you're also dealing with new data sources and new data types. To deal with this explosion of data, we had to invent an entirely new form of AI — the world’s first AI engine that’s based on unsupervised machine learning. The other AI solutions you’ve heard about are based on supervised learning, which requires data scientists to carefully select the goals they are looking for before getting started on the problem. This isn’t new, data analysis has always required people to develop an intuition for where there might be value in their data. Data Scientists and Analysts develop these hypotheses and test them to find insights. This approach has started breaking down as data has increased. It's not fair to ask people to intuitively know where the important information is when your data grows in complexity every year. As you get more data, your teams can only analyze some portion of it. This unanalyzed data means missed insights. Over 80% of business data doesn’t get analyzed today, and the insights hiding in your data hold valuable ways to improve your key metrics. Unsupervised AI can automatically analyze your data in it's full complexity — finding what might be valuable and giving those insights to your team, so that they know exactly where to look for your next big growth opportunity. And that’s our core belief: When you find actionable insights for your teams, they are great at making brilliant decisions. Is Unsupervised right for you? Trusted by Fortune 500 category leaders. Our software helps large companies find value in their data. When you serve tens of millions of customers, it's impossible to understand them individually — you have to look for patterns that accurately represent sizable portions of customer behavior. 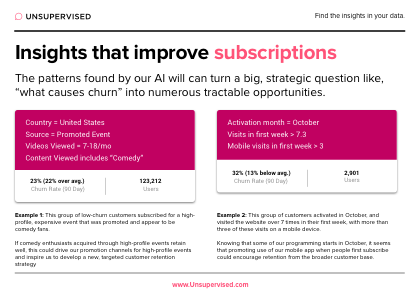 Unsupervised uses AI to automatically discover these patterns for you and your team. Assuming you have key metrics that you want to optimize — and data about your business — we can help you discover the patterns in that data that can help you improve performance on your most important metrics. You can apply Unsupervised to any number of opportunities: decreasing customer churn, increasing your average order value, decreasing your call center costs, increasing your revenue, decreasing customer complaints and support costs, optimizing your media spend, improving employee satisfaction and retention, and anything in-between. See why top companies, in industries from retail to renewables, trust Unsupervised to help them make better data-driven decisions. Request more information to find out what Unsupervised can do in your organization.